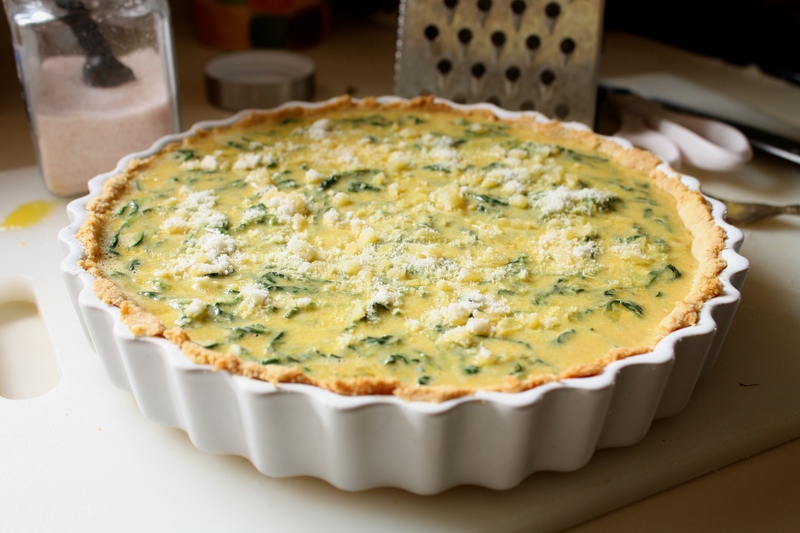 A tasty spinach and garlic quiche baked in a delicious gluten-free almond/coconut crust. Great way to celebrate breakfast, the holidays or a meatless-Monday meal! 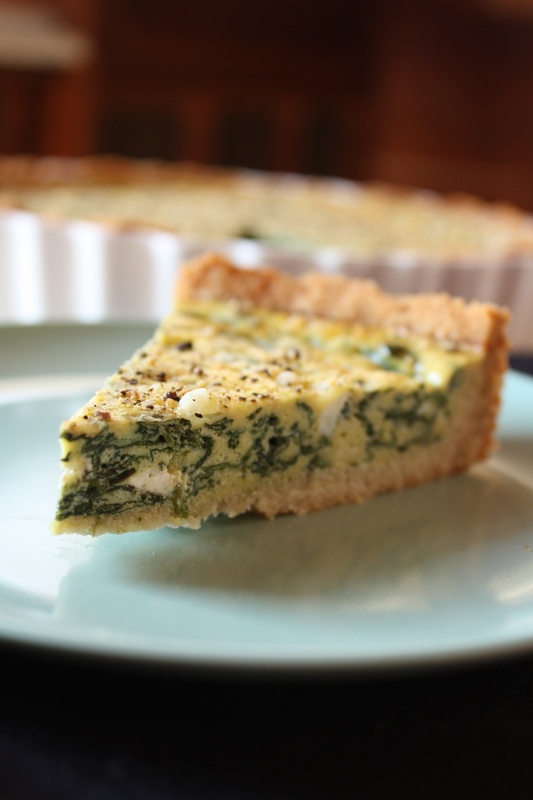 After creating this gluten-free spinach quiche, I have made so many filling variations, but the original is still one of my all time favorite gluten free quiche recipes! The idea behind Meatless Monday is to encourage people to make healthier choices for themselves and the planet. Starting a healthy eating campaign at the beginning of the week is the natural choice to help people start the week out on the right track after having possibly made some not so healthy choices over the weekend. I personally have no idea what they are talking about. I have never made an unhealthy choice over the weekend, have you? Sadly, even though I reeeeeeealy want to be a vegetarian, I have not completely been able to give up meat. Maybe it’s the bacon – It is definitely the bacon – but I can make the choice to cut back. Meatless Monday is the perfect place to start. 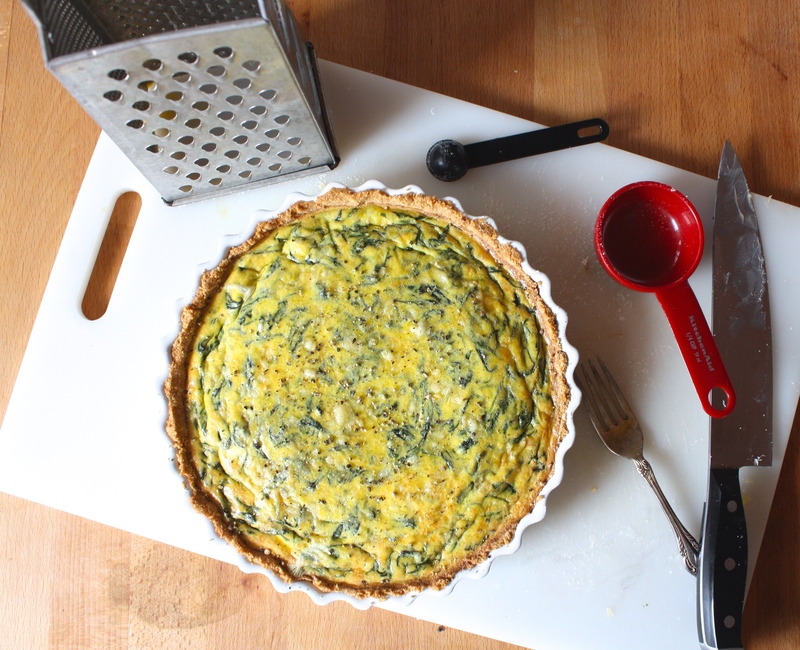 I created this awesome Gluten Free Spinach Quiche last week and it is soooooo not missing anything without the meat. The spinach and garlicky goodness of this dish is on a level that savory quiches only wish they could grow up to be. Because I wanted to be able to share it with my gluten-free friends, the crust is a blend of almond and coconut flour instead of wheat. IT IS SUCH A GOOD CRUST PEOPLE! I want to make it and fill it with everything, just as an excuse to eat more. If you like Gluten Free Spinach Quiche, then you’ll love this RED KALE, SAUSAGE, AND CHEDDAR BAKE, or this HEALTHY GREEK YOGURT BOWL. This recipe is also amazing served with a side of VANILLA MINT SUMMER BERRIES topped with a dollop of Madagascar vanilla bean creme fraiche. It’s soooo good you guys! 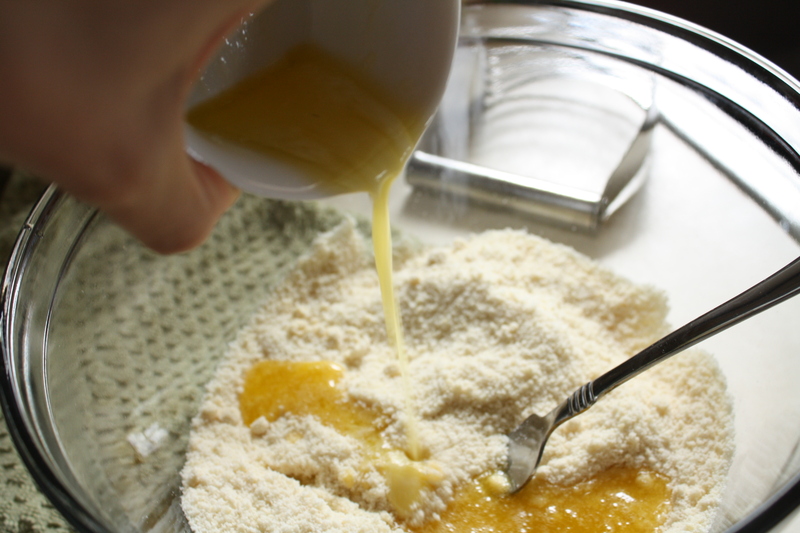 1) Mix Flour, cheese, salt and baking soda in a bowl and add melted butter to form a crust. Press crust into a pie or tart pan. 2) Saute spinach, garlic, and salt. Add cream cheese and mix until melted. 3)Pour mixture into pie crust and top with cheese. Bake for 35 minutes or until eggs are set. Who could have a case of the Mondays with this deliciousness? I hope you are inspired like me to go meatless and experience the produce flavors of the season today. Spinach is a green leafy vegetable that originated in ancient Persia, where Iran is located today. It is considered one of the best foods to help fight inflammation in the body, as well as help to fight aggressive prostate cancer in stages III and IV. Compared calorically with other foods, spinach provides more nutrients than anything else. This leafy vegetable is low calorie and ranks excellent in antioxidants and nutrients such as vitamin K, vitamin A, manganese, folate, magnesium, iron, copper, folate, vitamin B2, vitamin B6, vitamin E, calcium, magnesium and vitamin C. Typically, the spinach season runs from March to May and September to October. 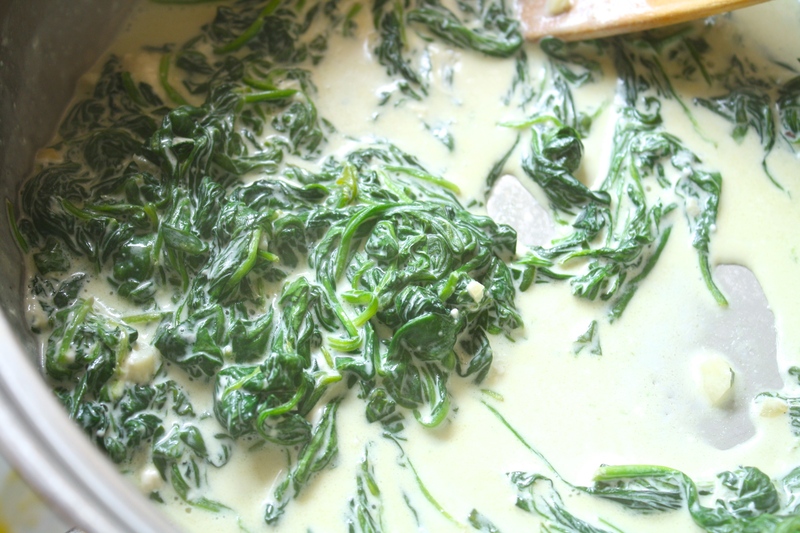 It is best to store spinach in the refrigerator for up to 5 days in an airtight storage bag, unwashed, as it washing may increase spoilage of the vegetable. Try to pick spinach that has vibrant green leaves without yellowing, wilting, bruising or slimy coatings. Tests have shown that the greener the spinach, the higher the vitamin C content. Spinach does contain oxalates which can cause a concern for people prone to kidney stones. To help decrease oxalates, spinach may be boiled for 1 minute, which may also help to sweeten the flavor. To Make Filling: While crust is baking, prepare filling. Whisk 5 eggs in a large bowl and set aside. Heat large frying pan to medium heat. Sauté garlic in oil for about 1 minute, just until fragrant but not browned. Add spinach and sauté until wilted. Water will release from spinach as it wilts - do not drain! Add cream cheese and salt and mix until melted. Remove from heat and let sit a few minutes. Add to eggs and stir. Pour mixture into pie crust and top with cheese. Bake at 350 degrees for 35 min or until set. Eggs will puff up while cooking and relax after they sit for a few minutes. Let sit for 10 minutes before serving. Enjoy! I made this for Easter brunch. It was fantastic! !